Brooklyn, NY - One day after a Borough Park area woman was raped by an unidentified intruder, the NYPD has released a video of a possible suspect and calling on the public for assistance in its ongoing investigation. Police said that the incident took place on Friday morning at 1 AM in an apartment building located near 52nd Street and 7th Avenue. 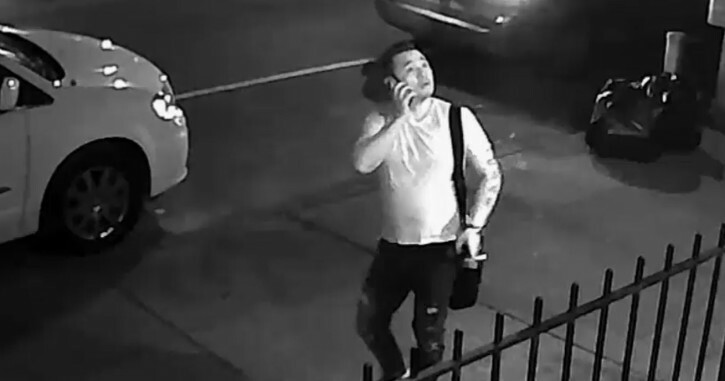 According to the NYPD, the suspect knocked on the door of an apartment in the building, making his way inside after the victim opened the door and forcing her into the bedroom where he raped her at gunpoint. Before leaving the apartment, the suspect demanded cash from the victim, tying her hands with a sweater and making off with $500. Once the attacker was gone, the victim was able to untie herself and call 911. The suspect is described as a 30 year old clean shaven Asian man, 5 feet 8 inches tall with a medium build, closely cropped hair, dressed in a light colored v-neck t-shirt, ripped dark pants and dark sneakers. Surveillance video taken nearby show a series of tattoos running from his upper arm until midway down his forearm and another tattoo on his upper right arm, partially covered by the sleeve of his shirt. Who opens the door to a stranger especially at 1 am? Excellent survielence photo. I expect a quick arrest. We need to stop the mentality of blaming the victim! There is clearly a perpetrator that is wrong and evil in this story. But its still a strong question. Why did this woman open the door at 1 AM? Forget blam8ng victim, it’s common sense!!!! Was there an audio? He might have threatened her.